All models have compact designs which allow for constrained space installations. Additionally, the Quiet-Flo air intake is below the output so that the blower can be mounted against a wall without any concern for flow restrictions. The blower will work with any air or electronic control system and comes with a standard NEMA plug. Optional unionized connections and check valves are available. 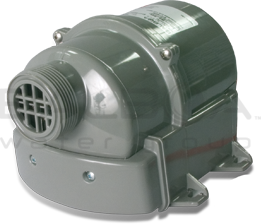 Note: All Quiet-Flo blower with material numbers starting with 8141-XXXX are US Patent No. 8,137,802.